Captain Albert W. Stevens of the U. S. Army has won the description of “the world’s greatest aerial photographer” through his remarkable photos taken from high altitudes. His is a thrilling business with a great deal more excitement in it than usually falls to the lot of a photographer. Several of his more thrilling adventures are recounted here. And the mountains listened, and did their best, even though the biggest of them all, Mt. Rainier, was just 227 miles away and quite invisible to the speaker. 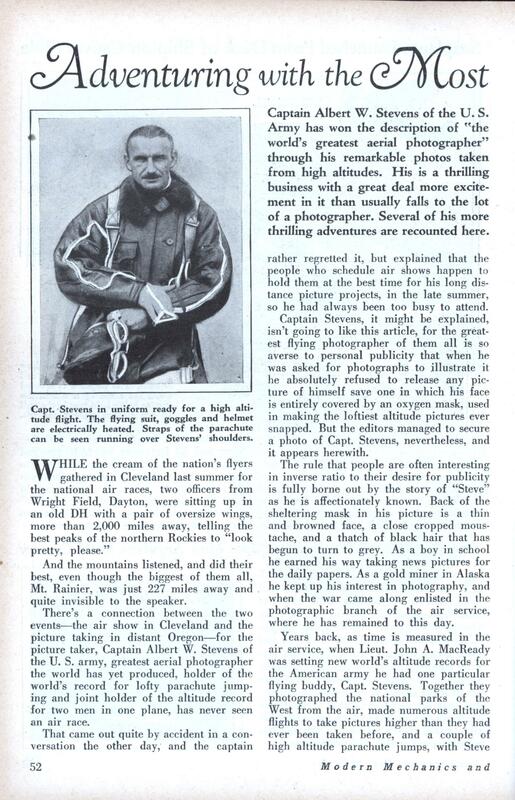 There’s a connection between the two events—the air show in Cleveland and the picture taking in distant Oregon—for the picture taker, Captain Albert W. Stevens of the U. S. army, greatest aerial photographer the world has yet produced, holder of the world’s record for lofty parachute jumping and joint holder of the altitude record for two men in one plane, has never seen an air race. That came out quite by accident in a conversation the other day, and the captain rather regretted it, but explained that the people who schedule air shows happen to hold them at the best time for his long distance picture projects, in the late summer, so he had always been too busy to attend. Captain Stevens, it might be explained, isn’t going to like this article, for the greatest flying photographer of them all is so averse to personal publicity that when he was asked for photographs to illustrate it he absolutely refused to release any picture of himself save one in which his face is entirely covered by an oxygen mask, used in making the loftiest altitude pictures ever snapped. But the editors managed to secure a photo of Capt. Stevens, nevertheless, and it appears herewith. The rule that people are often interesting in inverse ratio to their desire for publicity is fully borne out by the story of “Steve” as he is affectionately known. Back of the sheltering mask in his picture is a thin and browned face, a close cropped moustache, and a thatch of black hair that has begun to turn to grey. As a boy in school he earned his way taking news pictures for the daily papers. As a gold miner in Alaska he kept up his interest in photography, and when the war came along enlisted in the photographic branch of the air service, where he has remained to this day. Years back, as time is measured in the air service, when Lieut. John A. MacReady was setting new world’s altitude records for the American army he had one particular flying buddy, Capt. Stevens. Together they photographed the national parks of the West from the air, made numerous altitude flights to take pictures higher than they had ever been taken before, and a couple of high altitude parachute jumps, with Steve as the jumper. On one occasion he stepped overboard at 24,200 feet, with an oxygen bottle strapped to his leg, to supply the necessary food for his lungs, and thereby set a record that still stands. Altitude records in parachute jumping had been rather frowned upon after one prospective jumper had accidentally pulled his rip cord at 20,000 feet before leaving the cockpit, with the result the opening parachute snaked him out at an 80-mile clip, slammed him through the rudder, knocking that useful device off the ship, and cutting the jumper’s arm to the bone, besides knocking him unconscious. Three miles down, and still about a mile up, he revived sufficiently to release a second parachute, then passed out again. Fortunately he landed near a farmhouse, was rescued and given emergency attention, and later recovered. 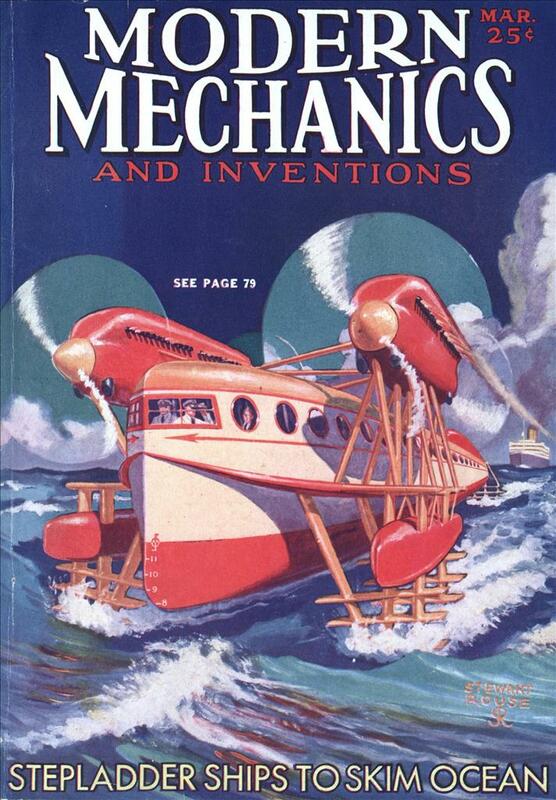 The pilot of the rudderless plane got safely down, using his ailerons to steer the ship. That was the status of high parachute jumping when Captain Stevens tackled the problem. In a super-charged ship he went up 24,200 feet, which was as high as the plane could be forced with the load it carried. Oxygen tanks had been turned on below the 20,000 foot mark, Stevens wearing his steel flask strapped to one leg. Stevens went over the side, pulled the cord and started down—and sideways. For every thousand feet he dropped he went a mile sideways before the wind. It took twenty-five minutes to get down, and he landed twenty-five miles from where he jumped. With a side drift of a mile a minute, he was still traveling at high speed sideways when he hit the ground, and the result was a broken ankle. On another high altitude flight he wore the twelve pound oxygen flask sewed into a pocket in the breast of his flying suit. When the parachute opened and stopped him with a jerk the strain was too much on the threads holding the pocket and they began to rip out, from the top down. As the flask tipped over and fell out Steve made a grab and picked it out of the air before it had fallen far enough to break the rubber tube to his mask. On all his high jumps the swaying, pendulum effect of the body suspended below the parachute was particularly pronounced, causing intense sea sickness after about ten minutes fall. With the steel flask clasped in his arms, and his body swaying in great arcs, he tried to find a place to dispose of the burden, and eventually anchored it beneath the shoulder strap of his parachute harness. A mile from the ground, a particularly violent swing again pitched the bottle out. Steve grabbed for it, and missed, then watched it fall, rolling end over end, until it disappeared in the distance, still well above the ground. The sequel was amusing. A farmer passing through a field, saw what he thought was the tail of a snake sticking out of a four-inch hole in the ground. He struck it with a shovel, and the tail bobbed right up again. Another blow, with the same result. Then the farmer examined his find, and found he had been battling a rubber tube. He dug down four feet and resurrected the lost flask, with the result it was returned to Wright field.